This week the builders have been finishing off the woodwork on the roof and both sides now have plywood over the recycled cellulose. 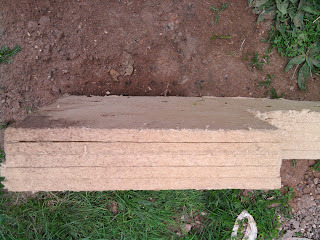 I've taken a photo to show a better detail of the insulation boards than the one I took a couple of weeks ago. 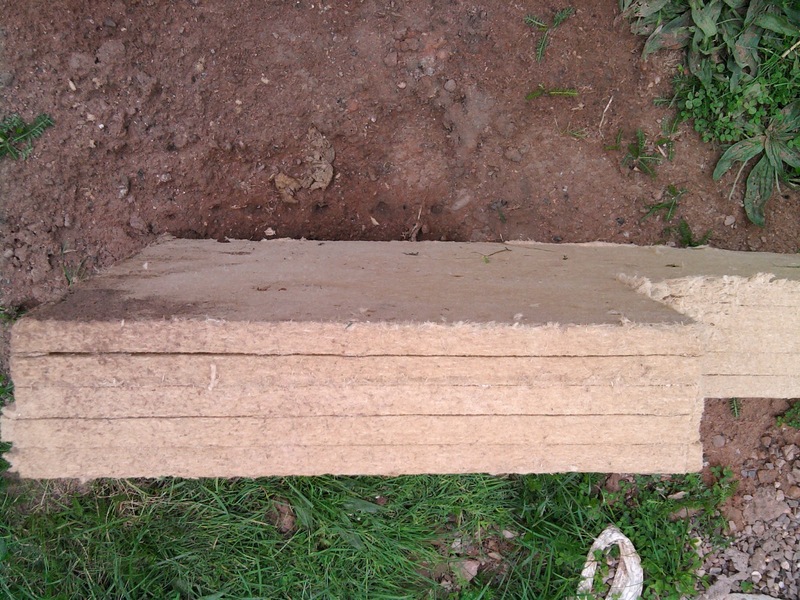 This is a cross-section through one board and shows the layers of cellulose that make it up. You can see why it needs to be covered in plywood rather than being exposed to the rain when it would crumble like weetabix in milk. This view from the south west corner is the only one to show any change from last week and that's quite a subtle difference but materials for the next phase have been coming on site all week, including the slates for the roof. Yesterday samples of the flooring arrived and I've been trying to work out which colours would look best. The floors are made of methyl methacrylate and this has been chosen because it will be warm and hard-wearing. If you check out the manufacturer's brochure it looks like we can do anything from pogoing to hurling chemicals on the floor and it will be untouched, so that's our weekends sorted. When I first saw the brochure it was tempting to match the names of the artists to the function of the rooms and I did find my admiration, or otherwise, of the artists was influencing my choice but now the samples have come I have had to focus. I've been on site with paint samples, floors samples and bits of fabric and I think I've picked my artists. Now I have to resist the temptation to melt a clock or stick a crustacean on the telephone. I did want a nice blue for one floor but, sadly, there was no Frida Kahlo on offer. It's the end of week 15 which means we are, theoretically, half way through the build. I'm putting the usual two views in for reference but it's the views from the back garden that show most progress. The roof beams are almost complete over the corridor section and on the south side the insulation boards have been overlaid with wood. At the moment this is covered with polythene in case of rain. The next thing is to complete the corridor roof and then add the roof windows but there won't be many deliveries this coming week as the local council are resurfacing the whole street - expect chaos. So far the channels are only on the internal walls as you don't want to make any holes in the external walls and compromise the airtightness of the structure (is that even a word??). That's one way of sorting out where the TV can go! I've been having to make CHOICES this past couple of weeks over kitchen units, work surfaces and floors. The first two were easy but the floors are going to be recycled glass and so far I only have a website to look at for samples and you can't really tell much from an online brochure. We will have the same flooring as NASA and Manchester airport, not to mention Sainsburys and the jury is rather out on my enthusiasm for this! Although neither of the two normal views look any different, at first glance, take a look at how the house looks from the road and you can see the roof has begun. A close-up shows a view of the second floor rooms that only Father Christmas or a passing bird will see in the future (hopefully the rooms will look a little more homely then). The roof beams are made of recycled timbers - hence the mosaic effect on close-up. Since that picture was taken the carpenters have started laying the roofing boards. They are being slotted together rather like a jigsaw and form a dense, warm base for the rest of the roof. You can check out the manufacturer's website at http://www.natural-building.co.uk/pavatex_roof_systems.htm. If you zoom into this picture you can get an idea of the boards' texture, which is like a cross between balsa wood and hand-made paper. The website says they are made of waste products from wood and I'm told that this basically means recycled newspapers.